The Leinster Rugby summer camp provides the perfect opportunity to keep them active over the summer months, while they'll also make new friends and keep them out of your hair for a few hours each day! 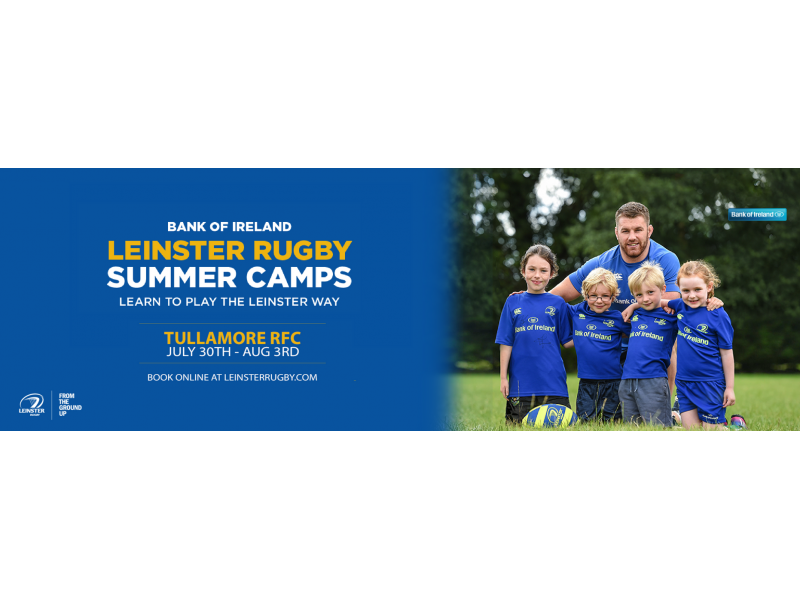 What are the Bank of Ireland Leinster Rugby Camps? The hours of the camp are from 9.30am to 1.30pm. Leinster Rugby will not be responsible for any child left unsupervised outside these hours. The Bank of Ireland Leinster Rugby Camps are for children aged strictly between 6-12 years. From the 2nd of June, each camp will be priced at the normal rate of €90. A second sibling can book a place on a camp for the reduced rate of €80. Any child can attend a second camp for the reduced price of €60 which can be purchased after the initial booking. No kit will be included with this offer. A booking fee plus bank charges of €5 will apply for all online bookings. This will not apply for any booking made via post. Confirmation of all bookings will be by email. Leinster Rugby has the right to refuse admission or to dismiss a participant whose conduct is deemed detrimental to other participants of the camp or Leinster Rugby staff. In such instances, no refunds will be made and any additional costs incurred including transport, will be at the parents/ guardian’s expense. Parents/guardians shall be liable for any medical expenses incurred. Photographs may be taken over the duration of the camps and will be used only for promotional purposes. One free kids Leinster ticket will be issued via a code from Ticketmaster during the 2018/19 season for a selected Leinster Rugby game. The camp will operate on the highest safety standards. Leinster Rugby shall not be responsible for any illness, disease, accident, or loss of property unless occasioned by the willful act of negligence on the part of the camp or its employees. Cancellations, for whatever reason, must be made in writing prior to the commencement of the camp and will be subject to a forfeiture fee. In the event of cancellation within 14 days or less, you will be responsible for 50% of the cost of the entire booking. People failing to arrive without prior notification are responsible for the entire cost of the booking.